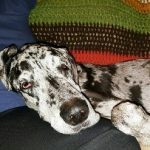 Meet Angus - Rocky Mountain Great Dane Rescue, Inc.
Hey there, I’m Angus! I’m a 7 year old merle male Dane with natural ears. I’ve had it a little tough lately, so I can’t wait to find a great home of my own! I’m okay with other dogs, though I can be a little fearful around them. I’ve never been around cats, so I would need a slow introduction. I know all of my basic commands and am housebroken. I need a little work on my leash – I can tend to pull, but I’m willing to put in the time if you are! I’m so excited to find my very own forever home and incredible family – could that be with you?